Vietnam Pollution Comes at a Price - Integration Through Media ....! (VOA): The air quality in Vietnam overall does not quite rival that in China or India when it comes to pollution. But it is bad and getting worse. And all that toxic air comes with a cost, whether in the money spent to upgrade to cleaner fuels, or in the health problems Vietnamese will suffer as a result. Environmental economist Le Viet Phu says sooner or later there will be a price to pay. “In Vietnam the last 10 years, we developed very rapidly because of low energy prices,” said Phu, who works at Fulbright University Vietnam. Postwar economic improvements have brought Vietnam a long way, but some are pausing now to reflect on the tradeoffs made in that time. Gross domestic product expands 6 to 7 percent every year. Meanwhile, though, the frequency of days when Ho Chi Minh City’s air is considered unhealthy for sensitive groups has doubled compared to two years ago. Scarier yet, 66,300 Vietnamese died from causes linked to bad air in 2013, U.S. consul general in Ho Chi Minh City Mary Tarnowka said, citing World Bank data. It’s not uncommon for schools to suspend classes for a few hours or even a full day to shield students from poor air. At home and at the office, tables and shelves have to be wiped down daily to keep up with the rapidly collecting dust particles. Industrial pollution is especially problematic outside of the urban centers of Hanoi and Ho Chi Minh City. But within them, 90 percent of the smog stems from traffic, Phu said. That’s why some are recommending motorbike drivers be required to get regular smog checks. 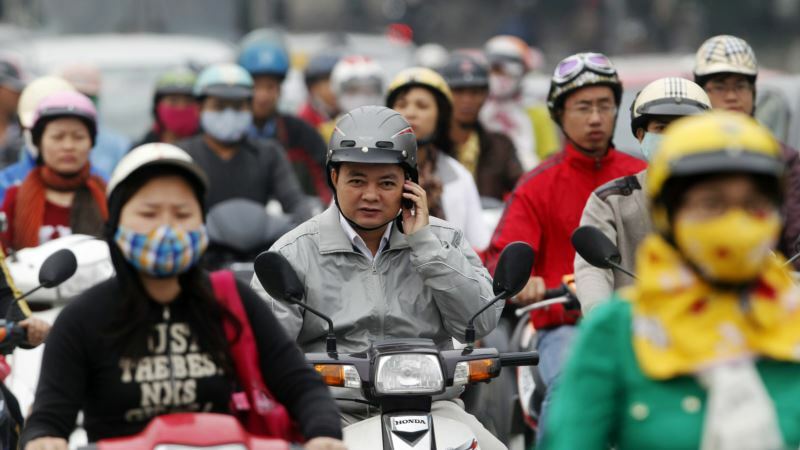 Vietnam has weighed a couple of other options to reduce pollution from congestion. The national government has proposed raising the gas tax, but has yet to do so in the face of public opposition. The governments of both Hanoi and Ho Chi Minh City have spent years building out subway systems to get people off private transit, but the dates for these to come online keep receding into the future amid budget shortages. But Vietnam would enjoy the biggest impact if it traded in coal for wind, solar, and other alternative energy, according to CHANGE, a Vietnamese environmental group. Director Hoang Hong said this will help the Southeast Asian country keep its pledge in the Paris Climate Change deal to reduce greenhouse gas emissions. “I hope Ho Chi Minh City, with its geographic and climatic advantages, along with its economic, technological and human potential, as well as the open mindset of both government and the people, will be a pioneer in the process of developing renewable energy in the country,” she said. Vietnam hasn’t reached the level of its larger, more polluted neighbors in Asia, and environmentalists are hoping there’s still time to make sure that never happens.